We are very lucky in this part of the world to have a special collections library like the Rauner at Dartmouth College. Last year I discovered that any member of the general public could go there and look at their amazing holdings of manuscripts and rare books; we are welcomed, and allowed to photograph. I wrote a blog post about my experience, which you can read here. 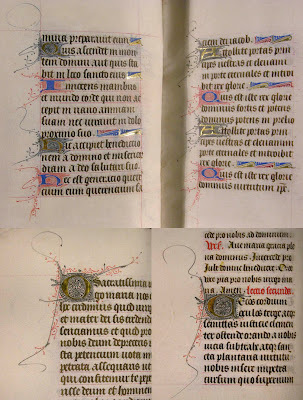 There is nothing like the feeling of handling and turning the pages of an ancient book, noticing the difference in weight and texture from one page to the next, seeing the individual hand of the artist, sensing history in your touch. 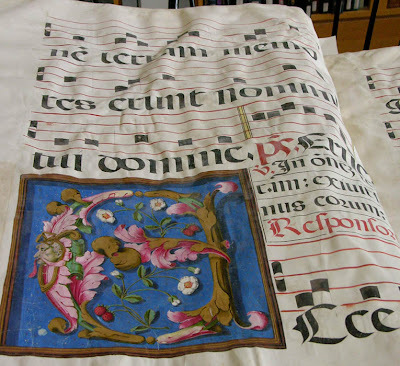 Because they are made with parchment, the consistency of paper we moderns are accustomed to does not exist. Each sheet is unique, as is each page, whether text or image. 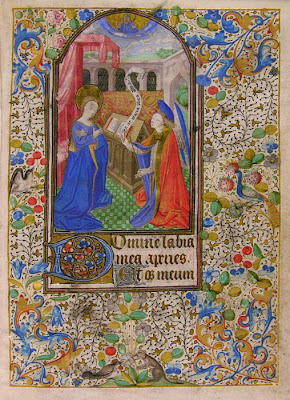 Illuminated manuscripts are also important to me because it was seeing a show of a Book of Hours, The Hours of Catherine of Cleves, at the Morgan Library that inspired me to begin to paint on parchment. Yesterday I had a desire to look at art, and the place to look at it closely is the Rauner Library. The first thing I saw when I walked in was the elephant folio of Audubon's Birds of America in a large glass case. How I would love to turn the pages of that amazing book! 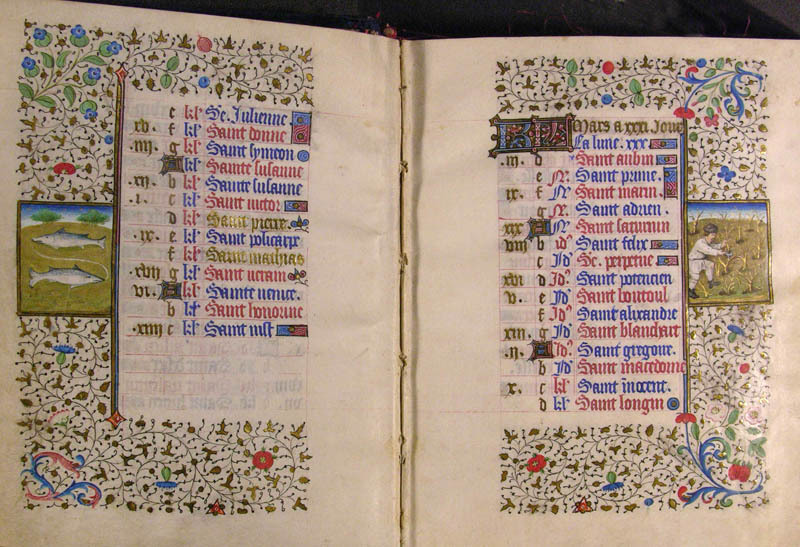 but my list of Books of Hours was quite wonderful enough. I looked at four manuscripts from the 15th century, three French and one Flemish. 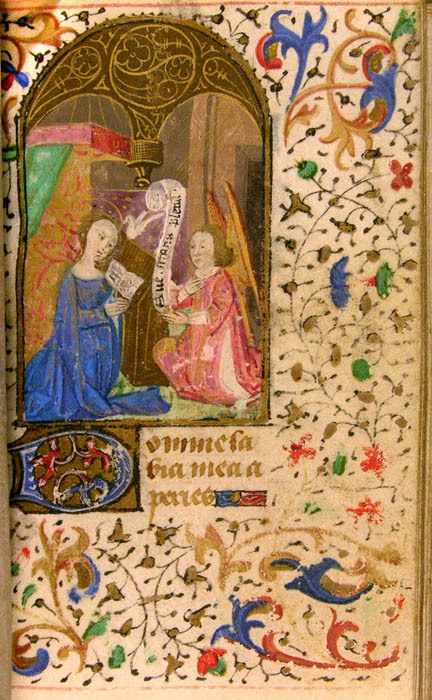 In this first manuscript, Ms. Codex 003141 (the links are to the manuscript pages on the Rauner Library website; you can browse the collection here. 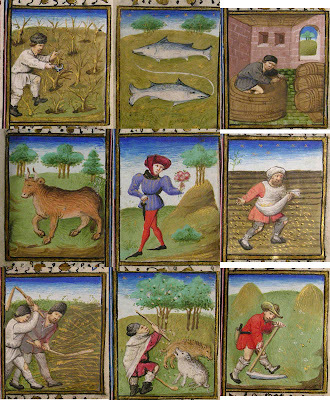 ), I fell in love with the small, approximately an inch wide, images of seasonal activities. 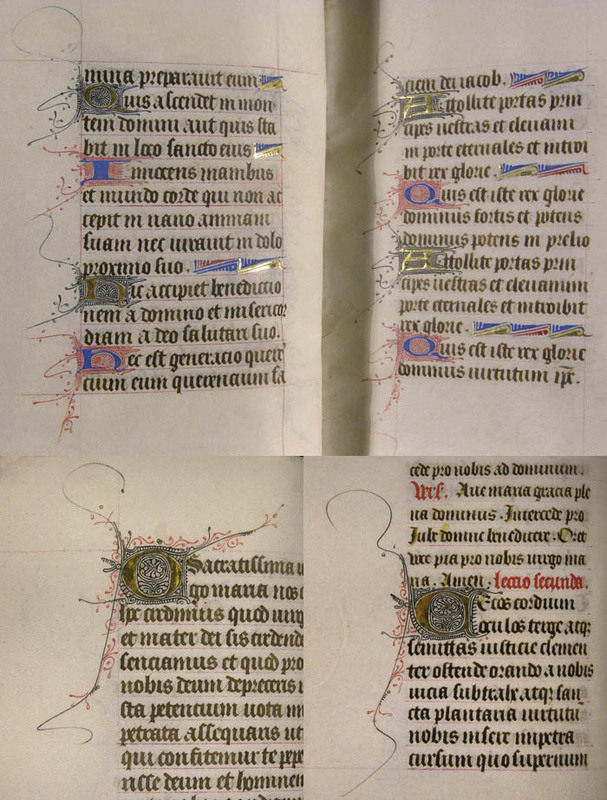 Above, I made a collage of several of these and below, you can see how they looked on the page. 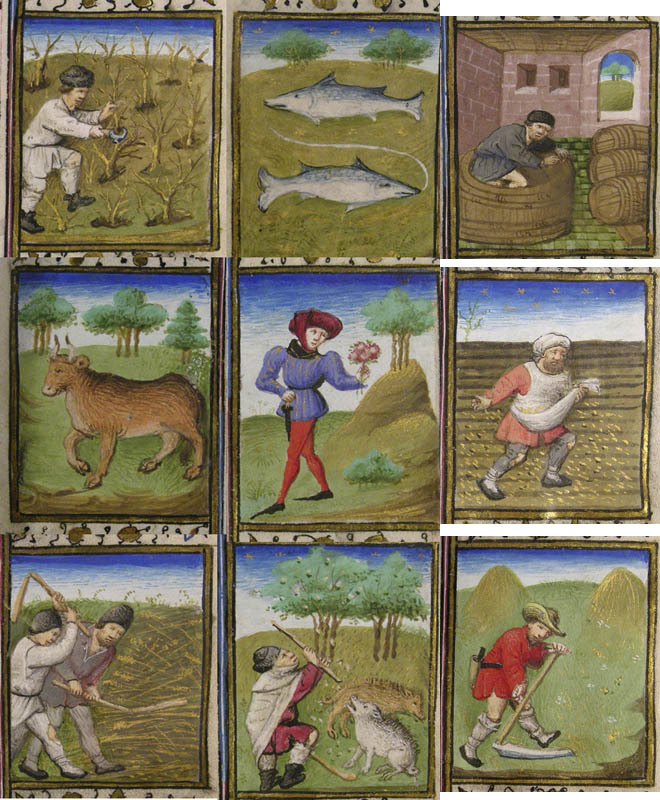 Of course, as with all my blog posts, you can click on the images to enlarge them. 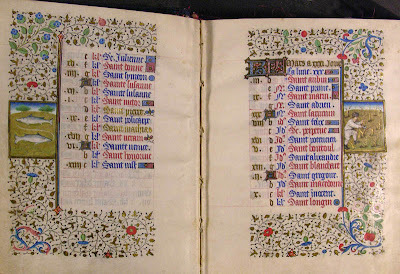 When I see the refinement and marvelous detail of the borders surrounding the illuminations, I have a feeling that the makers of these pages loved color, loved ornament, loved nature. I believe that much of this was convention, but such a terrific convention. 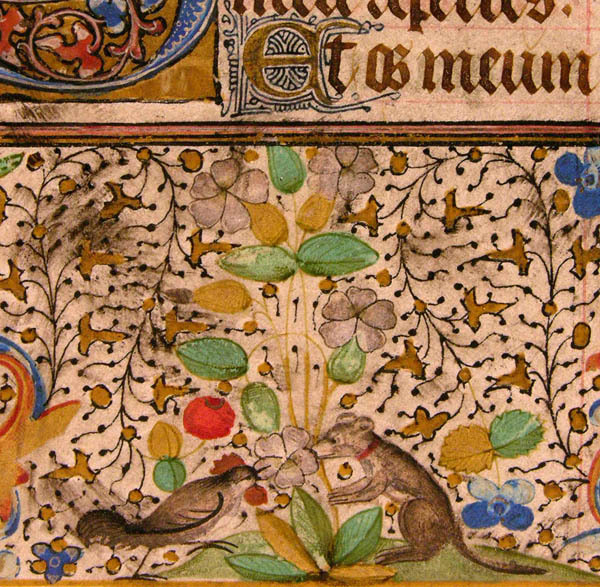 Attention and care and sometimes even humor were lavished on these books: on the lower edge of the border are two creatures, a bird and what looks like it might be a mouse, convening around a flower. 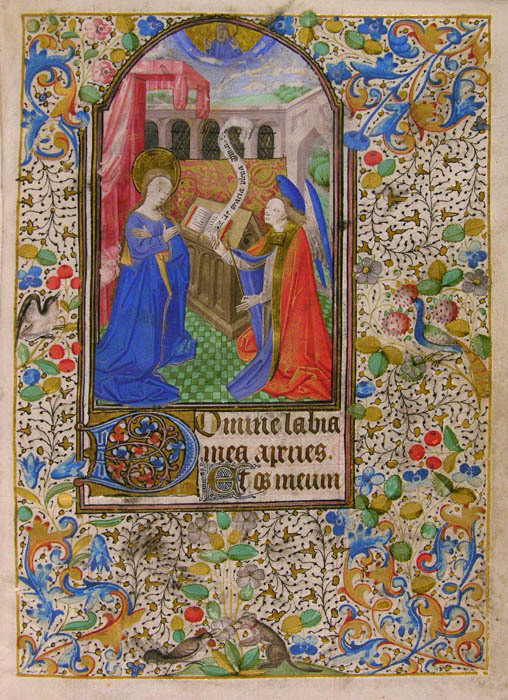 The other aspect of this Book of Hours that I found entrancing were the decorative flourishes emerging from each illuminated letter, flowing with grace and energy, as though to enliven the regularity of the gothic script, or even add a touch of wit. 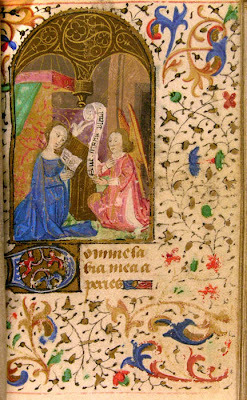 This is a tiny book with paint that is clearly worn, missing or rubbed off entirely, as in the page below. It is touching to think of the years of hands turning pages and the toll they take. When I think of how much does survive, I realize how precious these objects must have been to their owners, how cared for and treasured. 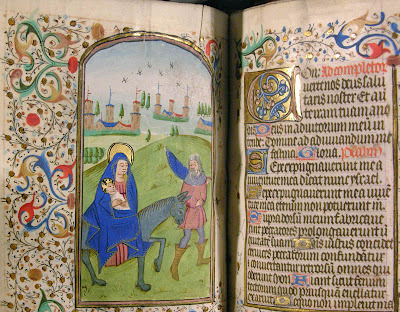 I have a soft place in my heart for "primitive" painting, as in the illuminations of this manuscript and the one before. 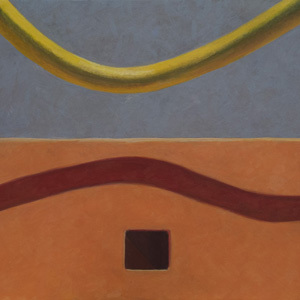 I find the flat forms and naive renderings of creatures and landscape engaging and charming; their directness enhances an air of religious faith. I wonder if a different artist painted the borders because they seem to me to have more sophistication than the narratives. Isn't the distant landscape wonderful, with the bannered castles and odd bird forms flitting through the air? 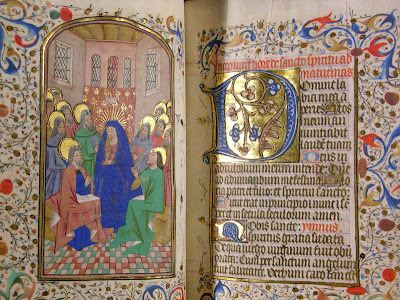 The clarity and simplicity of the illumination is a respite from the busy decorative border and dense illuminated Gothic text. 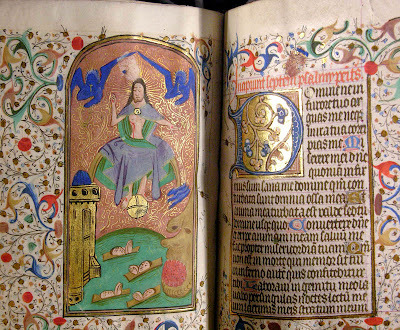 I love this Last Judgment: the souls floating about on a green sea, the castle of Heaven on one side and a strange gaping red maw on the other, with curlicues of gold surrounding Christ. 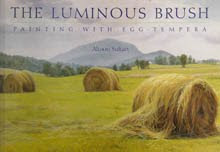 The color relationships, subtle with the green and violet and soft red, more strident with the splashes of deep ultramarine, create a bouncing pattern. Finally, to end my visit, there was a huge book resting on one of the tables and I couldn't resist opening its very heavy original cover and looking inside. 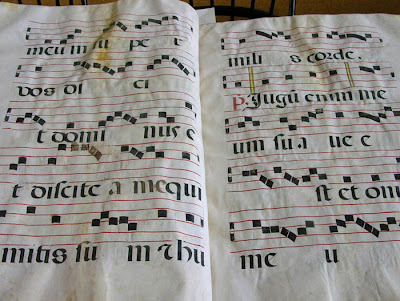 It is an Antiphonal, music for a call and response kind of singing, for congregation or religious community. 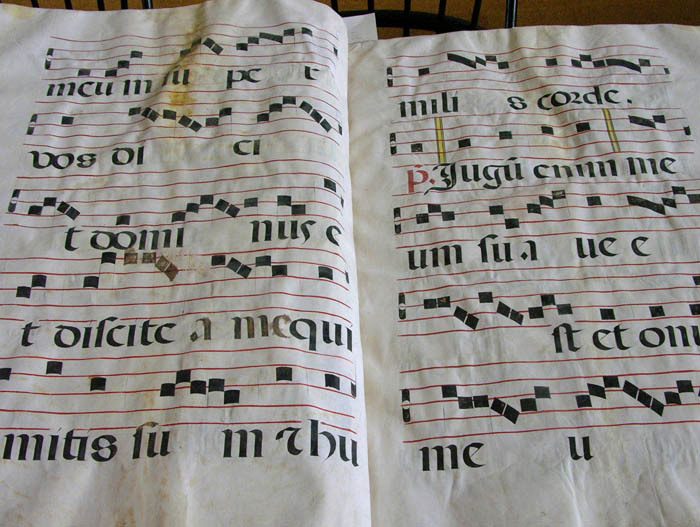 I was very intrigued by the notation, which is square; it made the entire page look to me like a modernist grid, with squares rising and falling along it. 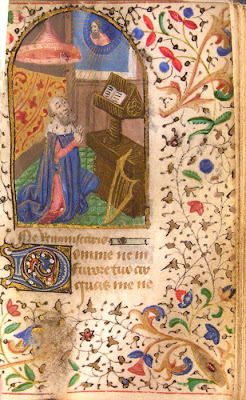 But on another page I found this gloriously fanciful illumination, adorning with flowing plant forms the severe geometry of notes and Gothic script. 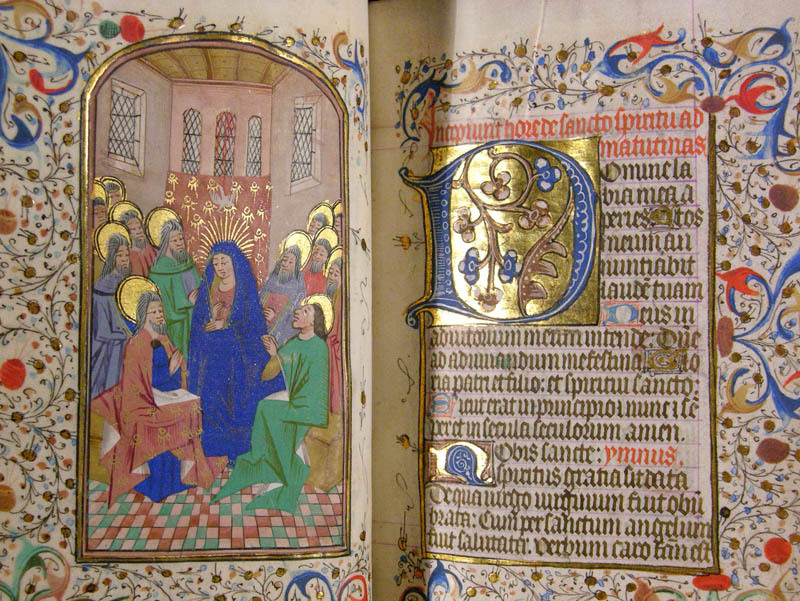 I encourage anyone within driving distance of Hanover, NH, and with an interest in ancient manuscripts, to take a trip to the Rauner Library; it will be an aesthetic experience like no other you've had before. I thought I'd move my tour to the back, north side of the house next, after having surveyed the front in earlier posts (links below). 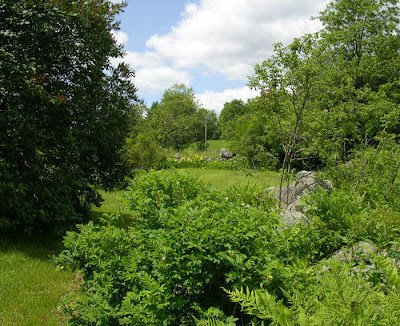 To the east of the house is a stone wall, now hidden by vigorously growing ferns. Beyond them is the huge lilac and to the right and behind is a glimpse of the backyard. In Vermont, the front of the house is called the dooryard, a term I had never heard before moving here. 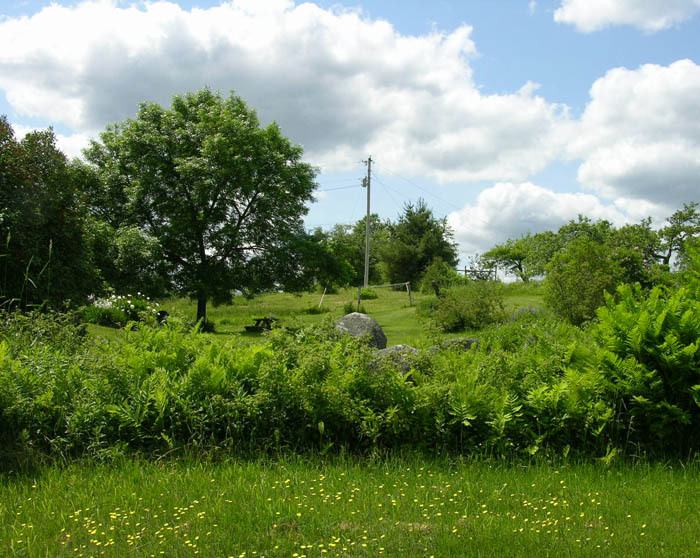 My back space is bounded by two stone walls on the east and north and is open to the west. Moving to get a further glimpse of the yard, you can see the ash tree that I planted about 20 years ago and now provides ample shade for the picnic table and a lounge on a summer afternoon. 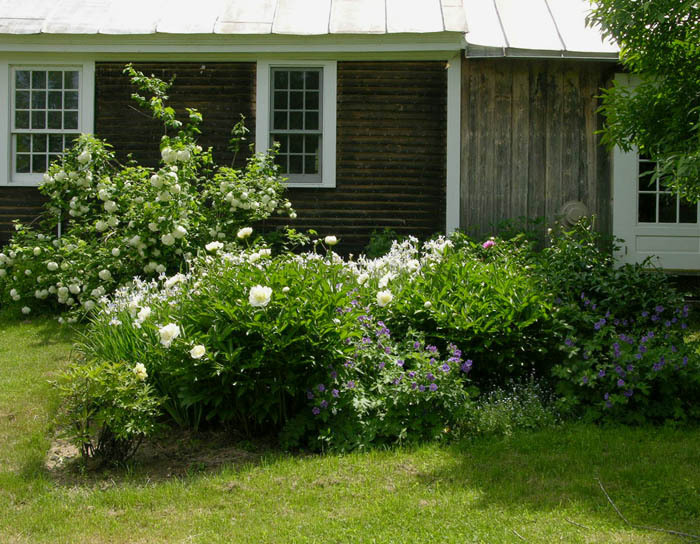 and once in the new space, the large flower border comes into view, and another round of wild pink roses, with flowers growing alongside the stone wall at its north end. At the time I shot these photos a couple of weeks ago, lemon lilies and white rugosa roses were blooming; later it will be daylilies and tiger lilies. Behind the wall of flowers is the apple orchard, containing some very old antique varieties. Here's a closer view of the border, with the bright white spots being snowdrop anemone, the purple baptisia and the deep purple at the back Siberian iris Caesar's Brother. 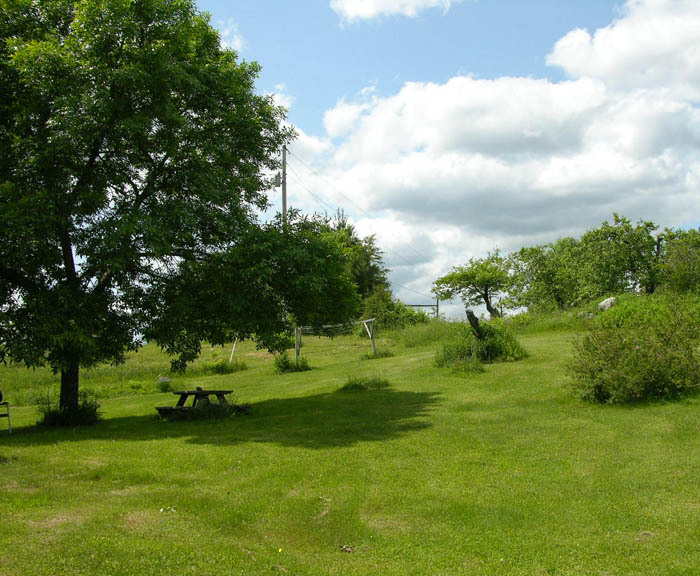 Moving my camera over to the left (south), I take in the picnic table and tree, and in the distance my laundry line. Then some old fashioned metal chairs, the kind you can sit in and bounce a little, which I find very relaxing. The door is the back door to the mudroom and the flower border is where my peonies grow, very happily. 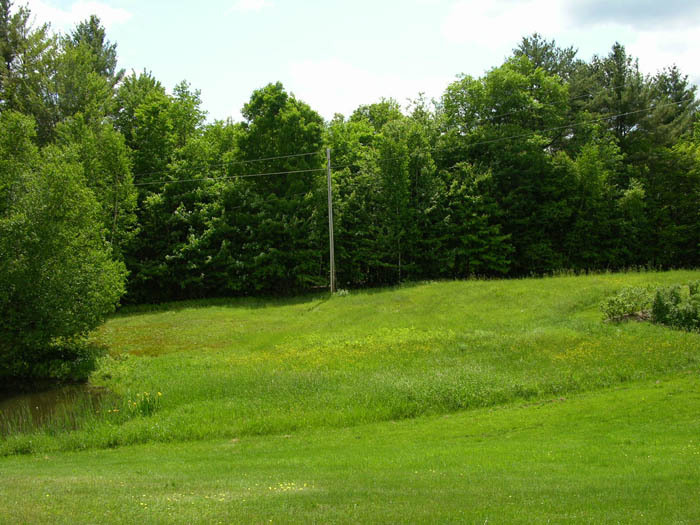 Most of my land is quite wet and that is the only border with well drained soil. It seems strange that land on a hill at 1300 feet would be wet, but it is, very. 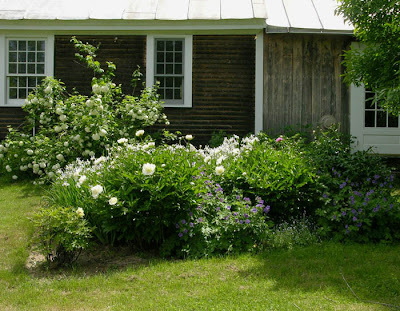 Finally, a closer view of the peony border, and behind it against the wall of the house, a snowball viburnum. 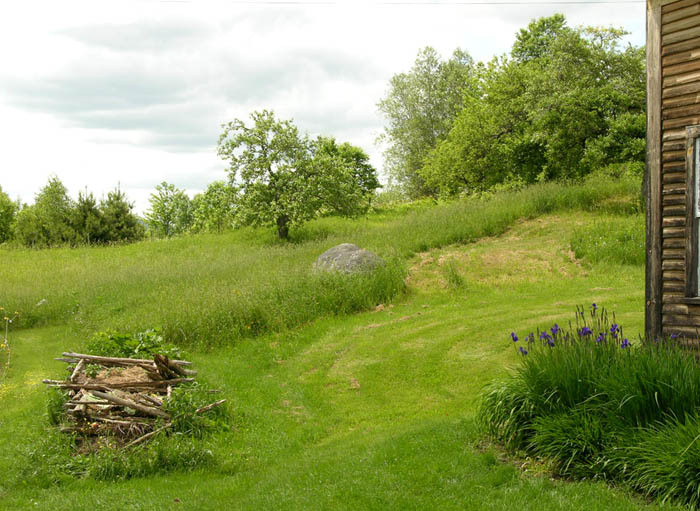 When I first moved here, the backyard was quite bare and stark; I've been happy that in recent years it's begun to look lush and welcoming. A New Painting: "Black Hoses"
Black Hoses, egg tempera on calfskin parchment, 7 x 4 1/2 inches. When I began to think of a title for this painting, the words that first came to mind emphasized the metaphoric nature of the image, a dark mouth spewing forth black snaky tubes: Maw, Spurt, Spew, Disgorge. But those words would push a certain reading and deny multiple interpretations. I can also see this as humorous, the bright blue enhancing that feeling: the hoses emerge from a chattering mouth like so many lengthened thought balloons. Or to see it non-objectively, a spray of black forms pinwheeling across a surface. 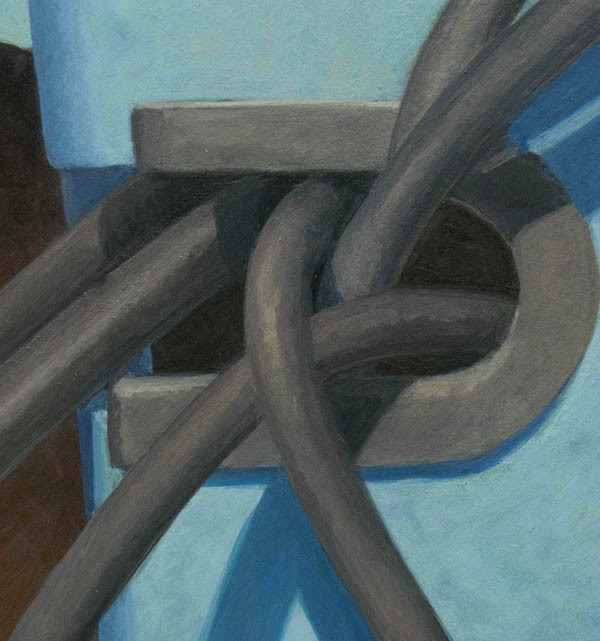 So, frightening or funny or abstract, I did not want to direct a response from the viewer, so settled on the neutral title Black Hoses; but not entirely neutral because it alludes to the real objects I've painted. Would Black Lines be better? Do you find that a title guides your response to an artwork? 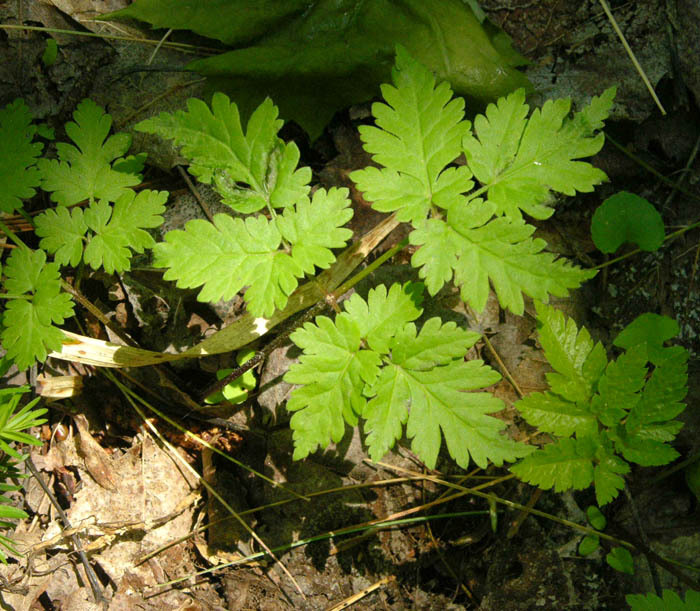 When I go for my walks through the woods adjacent to my home, I spend a lot of my time looking down, paying attention to the shapes and colors and textures of low-growing things: plants, mosses and lichens, fungi. A couple of weeks ago I decided to document some of my favorite leaf shapes, shapes of plants I can't identify except for one. 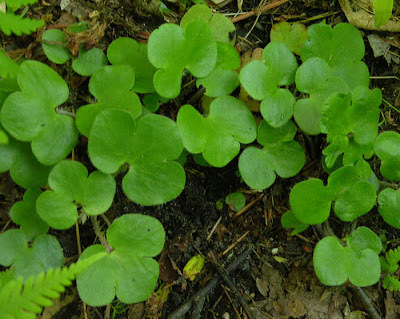 The charming mass of almost cartoonishly bulbous three part leaves above are my favorites, and I look out for them each spring; they simply make me happy. 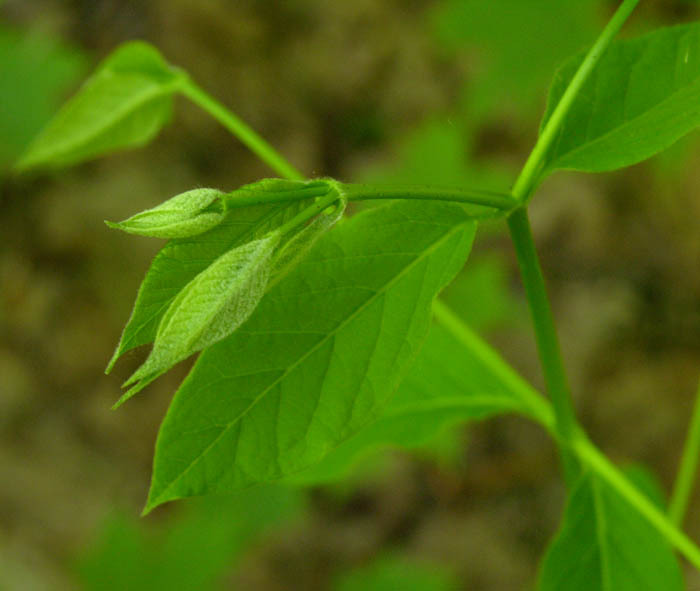 There is so much variation within a three part pattern, from the first plant to this, and even within the growth pattern of the same plant, as the leaf adds complexity as it grows. 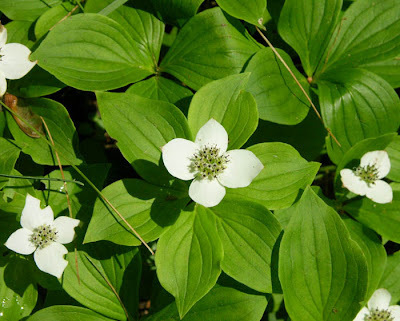 This is bunchberry, a low growing form of dogwood that carpets the path in one area of the woods. The leaves grow by fours or sixes from a perfect center, whorling their points in a circle. The white "petals" of the flowers are actually bracts, a specialized leaf, and the flower is the small round mass at their center. 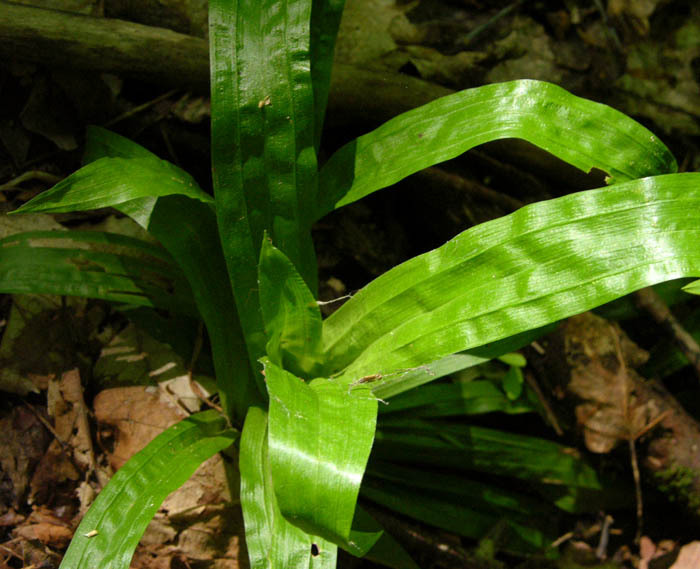 I also love these leaves, rising from a center, and displaying a kind of corrugated folding which catches the light in vertical and horizontal movements. Last year I tried to watch out for flowers that might emerge from the leaves, but never saw any. Three leaves attach to the end of a stem, and their edges are serrated so finely that it seems a frothy mass. This plant rises above the ground. I find its new leaves, softly and delicately folded, with a lighter and cooler color than the older leaves, so poignant. They give a sense of the tender vulnerability of new life, wherever it emerges. 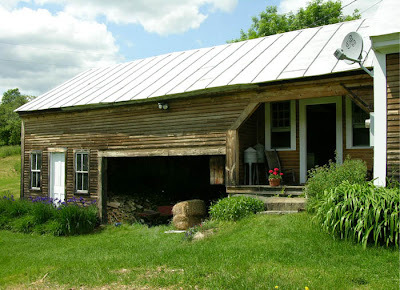 Last year I began an occasional series on the built environment – see posts on small cottages, a covered bridge, barn cupolas, a little bridge in the woods– so when I was out photographing farm machinery for my paintings on a beautiful Sunday, I thought I'd write a post on the architecture of one of my favorite farms in northern Vermont. 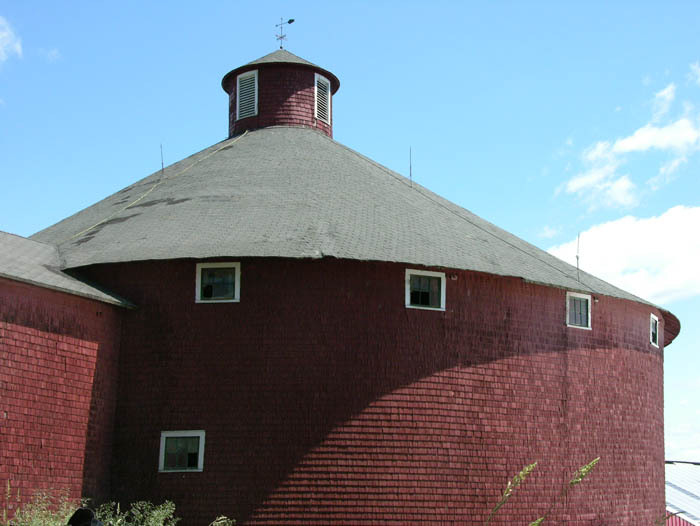 The dominant structure on the farm is a large round barn, dramatic and beautiful. It is always startling to see a building of a shape other than rectangular, and there are several wonderful examples in Vermont. These buildings were popular in the late 19th to early 20th centuries and were seen as labor saving designs: feed was more easily distributed from the center of the building, and waste removed. I am guessing that with more and larger machinery, rectangular barns with central aisles became more efficient, so the round barns were no longer favored. 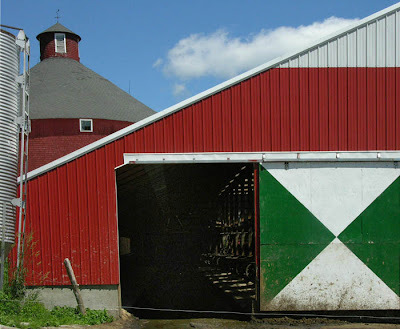 This is the more usual barn shape, and you can get a glimpse of stanchions for the cows in the dim interior. The French Canadian ancestry of the farmer is shown in the strong green and white design painted on the barn doors. 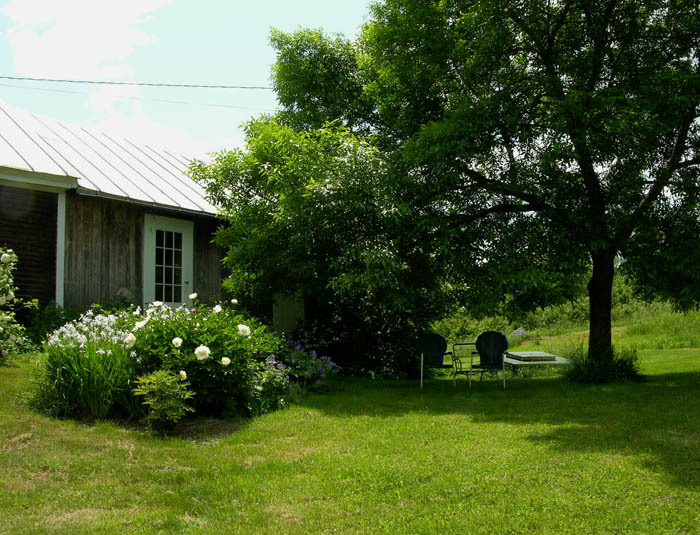 This part of Vermont is very close to Québec, where farm buildings are often painted in vivid blues and greens. 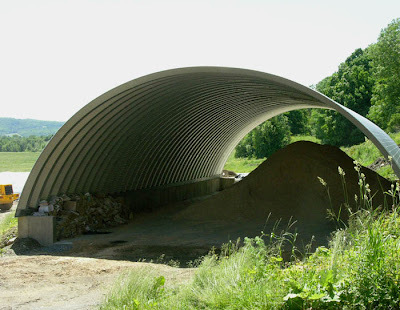 The most modern structure on the farm is a quonset style building, probably inexpensive to erect. It is easy to get in and out of; it stores sand, which is used as bedding for cows. I can think of it as beautiful in its simplicity, and in the way the corrugated metal captures and reflects light. 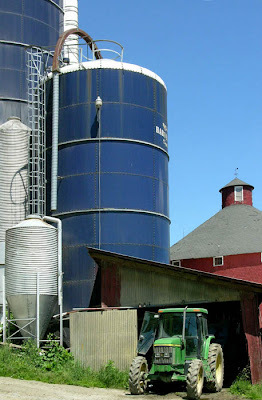 The very large dark blue silos, Harvestores, can be seen projecting their upright mass on farms around the US, but here in Vermont, they are relics of a recent past and are rarely used because expensive to run. These days most farms use concrete bunkers or huge plastic bags to store silage (chopped corn) or haylage (chopped hay), cheaper and easier to use. When I saw the farmer bringing the cows in from pasture at midday, I asked him why he was milking at such a strange time; most farms milk twice a day in very early morning and evening, twelve hours apart. 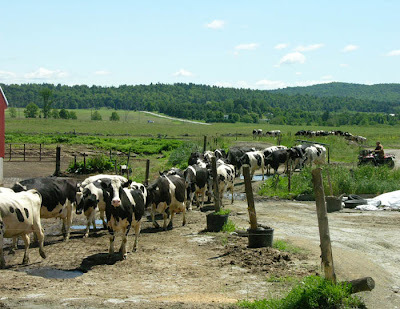 Oh, he said, he's not milking, but because his farm had become organic, the cows were required to be on pasture for a certain number of hours a day. Most large dairy farms, and this one is large with 200 milking cows, now keep the animals indoors all day in a freestall barn, a lot less work than pasturing them. I was pleased to learn he'd become organic, a long and difficult process, but worth it for the higher price he gets for bulk organic milk. It's a plus for the farmer, for the land, and for the consumer. 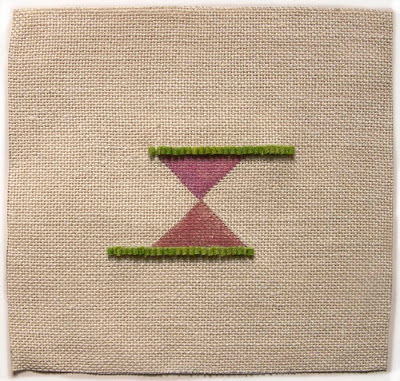 2011 # 24, hand dyed wool and egg tempera on linen, 10 x 10 1/4 inches. When I made my last group of hooked wool drawings, which you can see here, one of the pieces was quite small, made from a scrap of linen. I thought it would be interesting to have four of the same small size, to hang as a group. 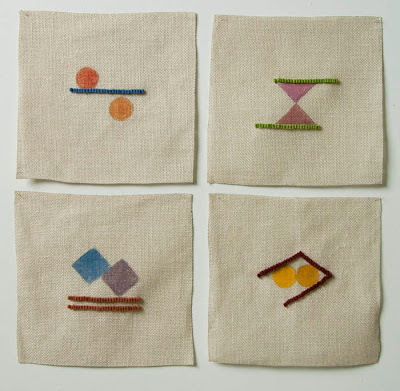 My idea was to keep them simple: two painted shapes accompanied by hooked wool lines. In #24 the side by side shapes float above two lines. 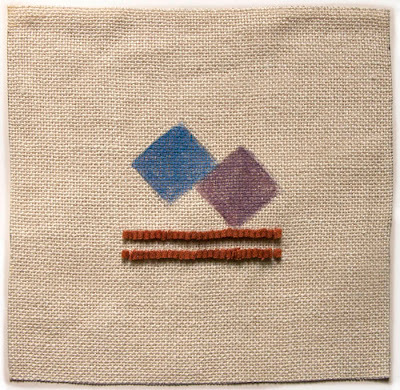 2011 #25, hand dyed wool and egg tempera on linen, 10 x 10 1/4 inches. 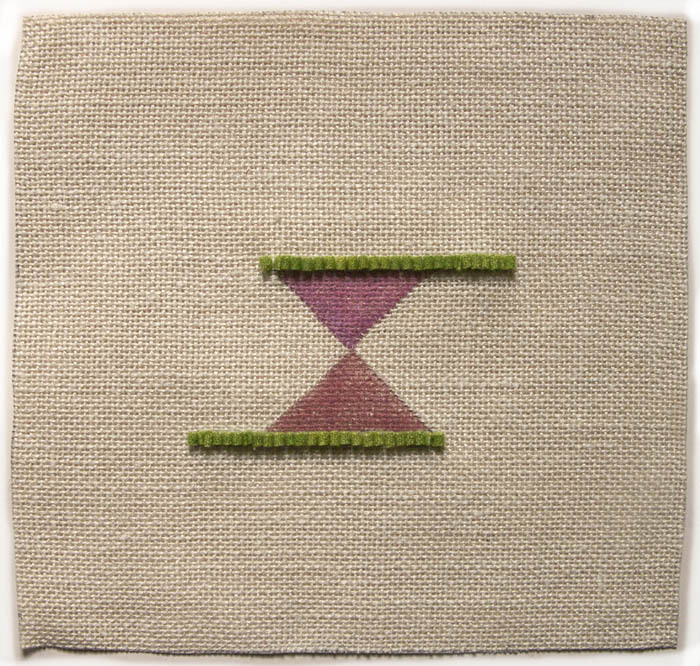 2011 #26, hand dyed wool and egg tempera on linen, 10 x 10 1/4 inches. In #25 and #26, the shapes are held inside the lines. 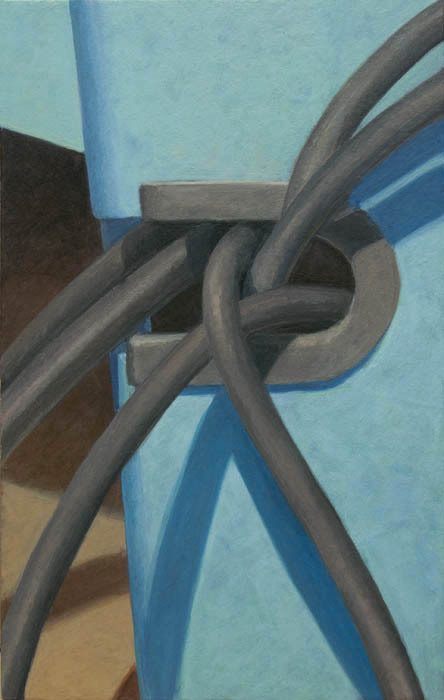 There's an odd balance between the flat painted forms and the lines that have an actual physical presence; so that the hooked wool doesn't completely dominate, I've used saturated colors for the painted shapes. Here are the four pieces hung together on the studio wall. 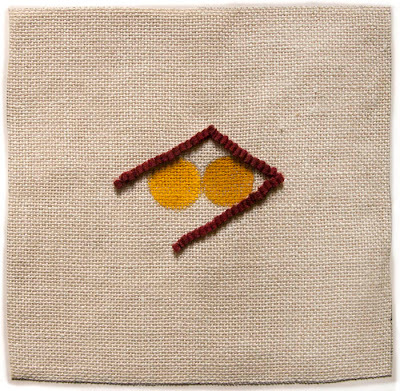 And below is a detail view of the one of the appliqué pins that I found at the local sewing shop and are perfect for hanging the drawings, with their small white tip that disappears against the work. I like the idea of an informal hanging, the pieces dropping loosely against the wall. 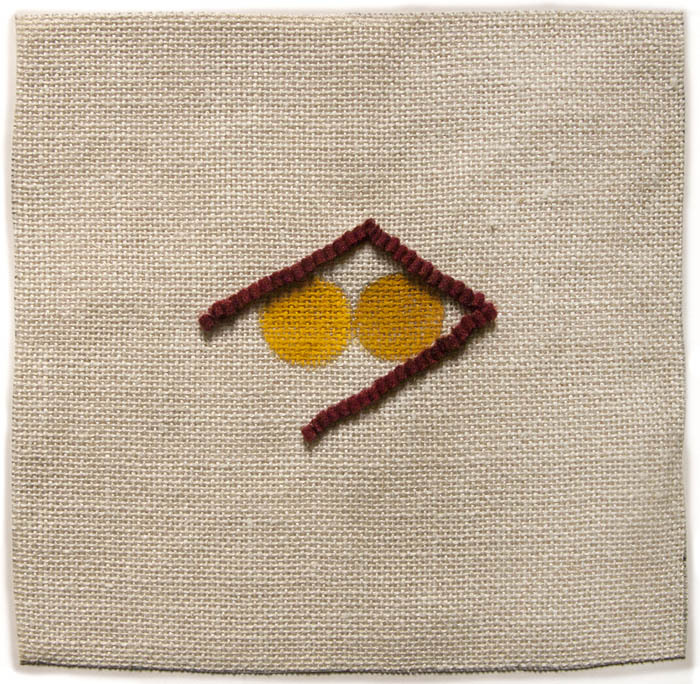 In this, I was inspired by two artists, Richard Tuttle and Blinky Palermo, whose works operate against a "high art" culture. Note: in my last post on hooked wool drawings I mentioned an upcoming show of these works along with paintings. Last week, the dealer decided to change the direction of his gallery, so my works no longer fit in his program; my promised show for September will not happen. I am disappointed, but such are the vagaries of the art world, and in the larger scheme of things it is not very important. Henry James said "Summer afternoon — summer afternoon; to me those have always been the two most beautiful words in the English language." I would like to add two others: June garden. 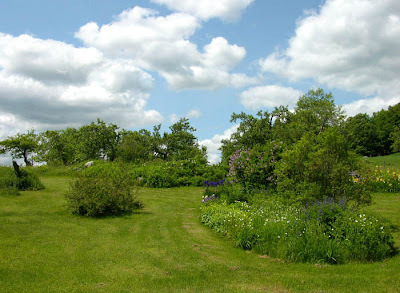 This is the season of delicious scents carried through the air; stepping out of my studio there is the sweet smell of roses, in the backyard, the heady aroma of Korean lilac. 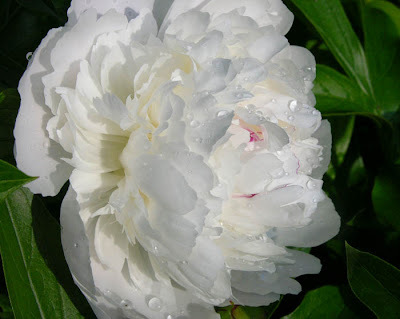 And peonies...ahh the peonies: white and pink and red, single and extravagant double; the yellow of tree peony. Each has its own character, a giant sensuous ball of innumerable petals or flat petals surrounding a frothy center. And most have a rich perfume. 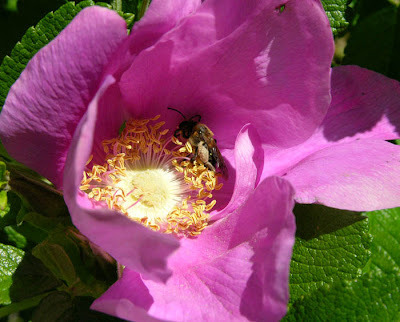 It is the time for roses, and the bees are deliriously busy gathering pollen; as I watch them, I can't help but think they behave as if drunk with pleasure, wallowing amid the pollen grains. Irises of all colors and shapes are now in bloom, from the regal siberian purple to the yellows of water-loving flag irises, to the multi-hued bearded iris. I look out toward the pond and see the blues and yellows of irises around its edges. My flower garden is at its height in June, celebrating the summer solstice, this year arriving tomorrow, June 21st, at 1:16PM. 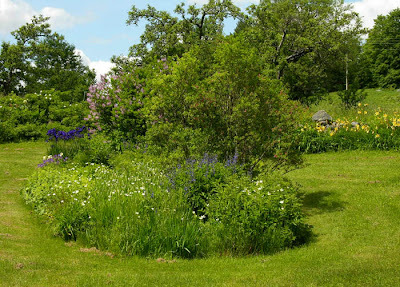 Of course there is much yet to come – daylilies, sunflowers, daisies and monkshood – but these blooms are my favorites. 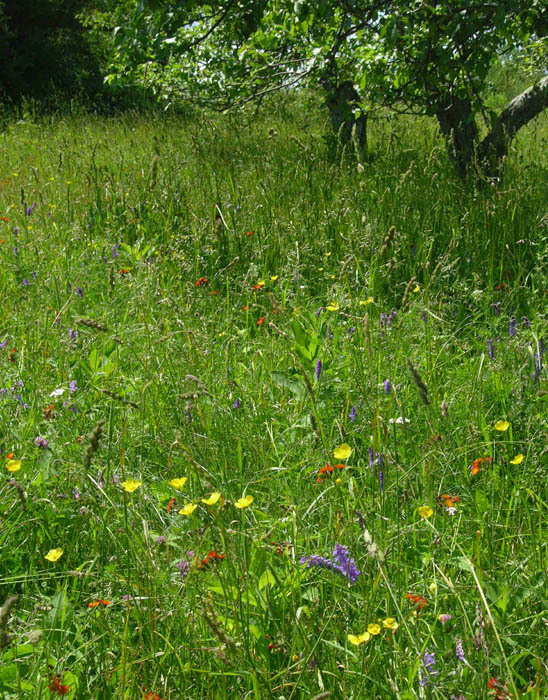 It's not only the cultivated flowers having their most exuberant moment, but also the small, brilliant wildflowers which transform a grassy field into a weaving of colors and light. 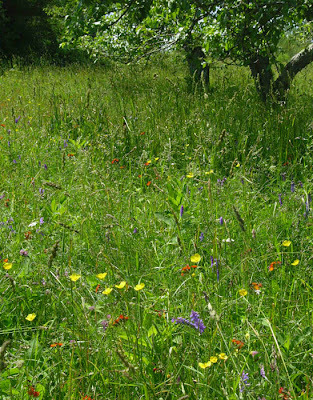 I catch my breath with delighted surprise when I step into the orchard and see this wild party at my feet. 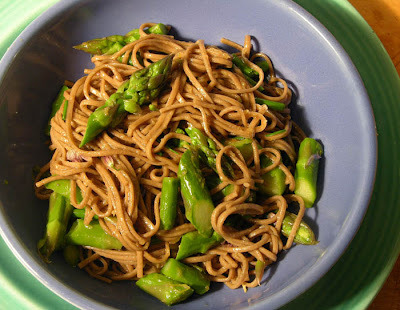 This is another simple and delicious recipe from Deborah Madison, in her book Vegetarian Cooking for Everyone. It is good at room temperature and easy to double for a crowd, so it's a perfect pot luck dish. I cook this all spring and summer long, when I prefer light meals. 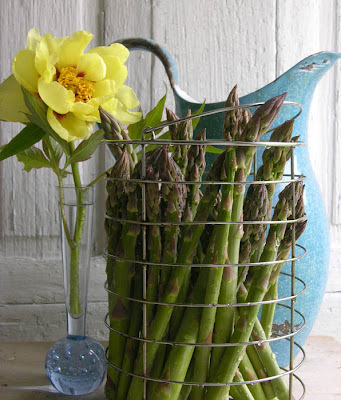 At this time of year I make it with asparagus, later I use broccoli or snap peas or green beans. Here is the recipe as given by Madison, but it is very flexible, as I note. Mix the marinade ingredients, stirring to dissolve the sugar. Steam the asparagus till tender, place under cool water to chill, then slice as you prefer, either thinly, or as I like them, about an inch long. Cook the noodles and toss with the marinade, most of the scallions, sesame seeds and asparagus; use the remainder to garnish the noodles when placed in a bowl or platter. I am standing in front of my house sweeping my camera from north to west to south in this group of photos, just as in the last post of this series I looked toward the east. On the western side of the house is the "ell", called that even though it is a straight line addition to the house and not in the shape of the letter "L". 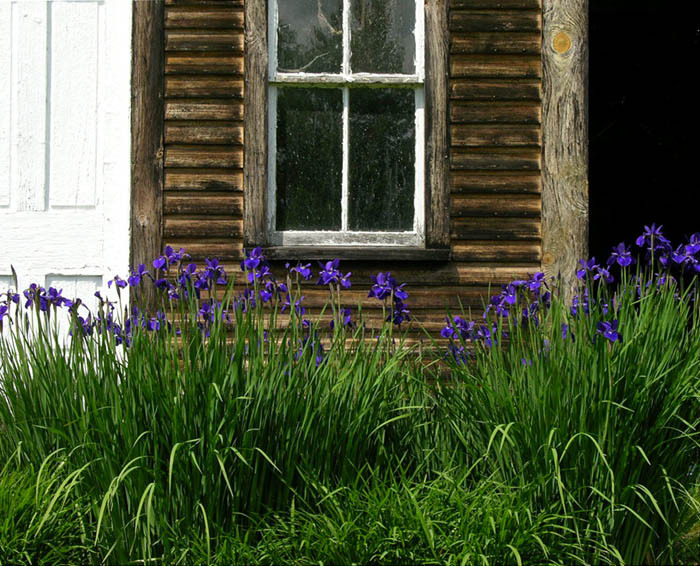 I generally enter the house through the door on the tiny front porch, into the mud room. Adjacent to the porch and mudroom is a large open shed, where I store tools and the winter wood supply. 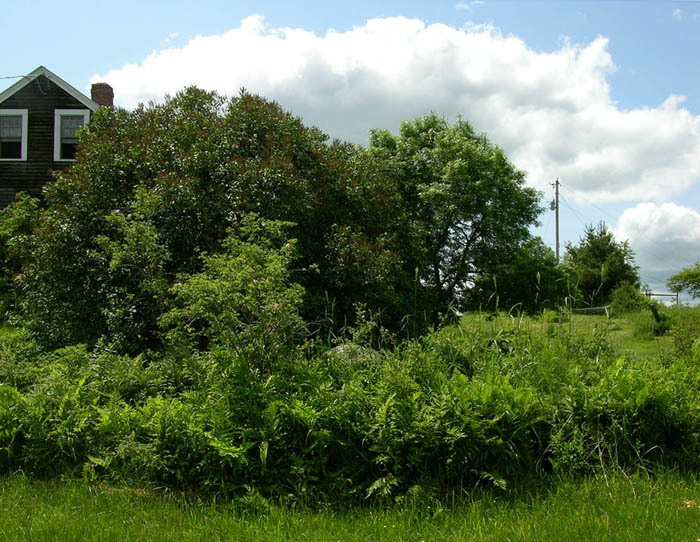 You can probably guess from its door and windows that the western end used to be a small house; the traces of chimney holes and upstairs room tell a tale of living quarters of hired help or extended family. Beyond the shed, just to its southwest, is my vegetable garden, which is about 50 by 60 feet and feeds me for almost the entire year. My land doesn't extend very far to the west, to just beyond the apple tree you see in the distance. I call that grassy bit of field my "back 40" and mow it only once a season. 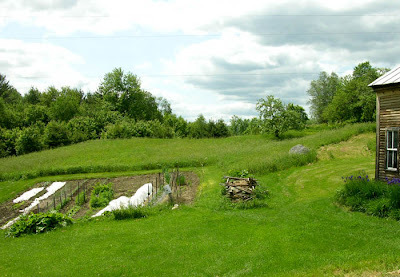 A little further to the south stands my berry patch: two long, wide rows of raspberries–which are very happy with the rain this year–and three high bush blueberries. When I moved here the raspberries were one giant circle of brambles and weeds; I wrestled them into shape over a couple of years and now they are very productive, providing me with lots of berries for jam and fresh eating and freezing for winter pies. And now I've swung my camera to take in the end of the berries and the western end of the pond at left. If you look at the previous post, you might get a sense of how it all fits together. Here's a closer view of the garden, with poles for pole beans at the right, a row of tomatoes, then moving to a line of covered crops: peppers and eggplants, which I grow on black plastic and under floating row covers to keep them warm. 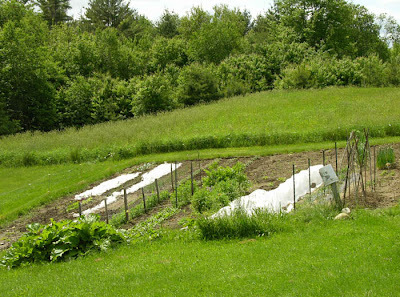 It's often difficult to ripen warmth-loving plants here, such as eggplants and melons, which I also start under cover. The white covers in the far left of the garden are there to protect brassicas from the predation of devouring insects; I will lift the covers when the plants are large enough to be able to survive the chewing of flea beetles. The mass of large leaves on the left are rhubarb. 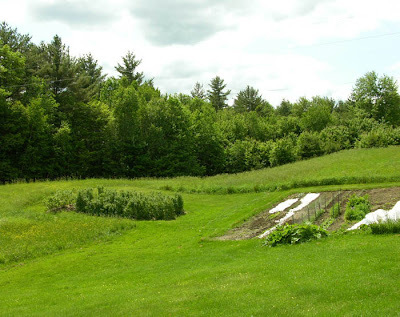 I'm planning to have the entire eastern side of the garden lined with rhubarb plants; they are a dramatic presence, and I'll be able to make lots of jam. 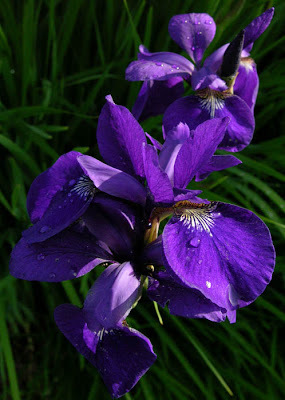 with the deep rich purples of Siberian iris "Caesar's Brother". 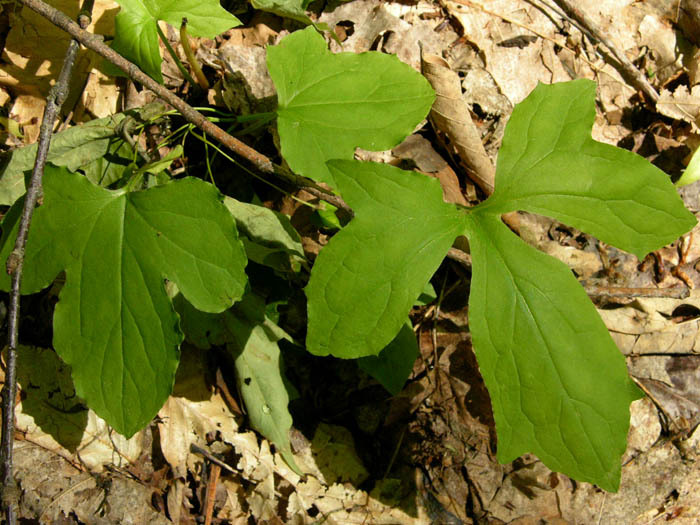 Their tall upright leaves, narrowly pointing, stay green and sprightly throughout the summer, after the flowers are long gone. 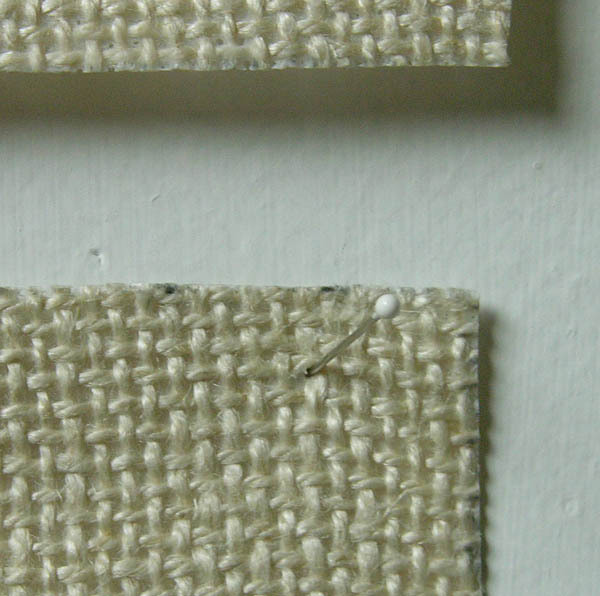 A New Textile: "Objects #2"
A New Textile: "Objects #1"